AVX Cloth is a tech sample that demonstrates use of 8 wide floating point SIMD processing with 256 bit AVX. 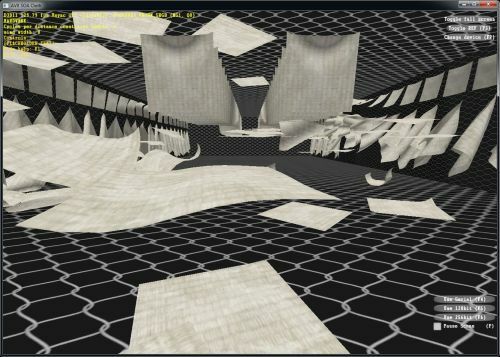 The sample has many active cloth pieces simulating as it showcases a SOA implementation of an iterative position projection (distance constraint based) solver. UPDATE: AVX is actually available on Seven with SP1. I will install SP1 asap! Here is a screeny of the demo from Intel website. Onloaded Shadows is a technique by which shadow maps can be calculated asynchronously on the CPU. 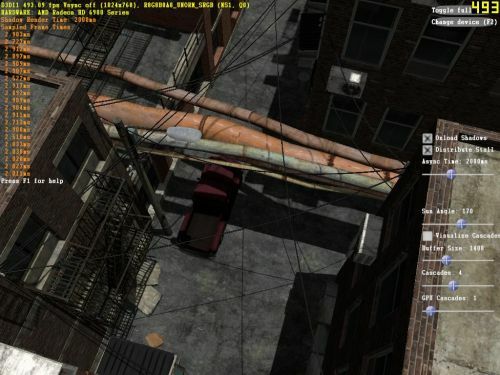 By using cascades, the shadow map for objects near the camera are calculated every frame on the GPU, but the shadow maps for objects in the second cascade and beyond are calculated less often on the CPU. This allows for better work balancing across the CPU and GPU. 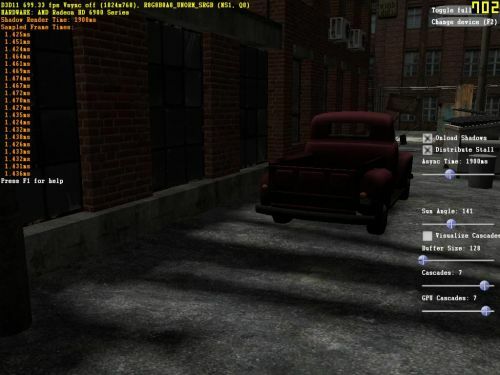 Download binaries and source code: Onloaded Shadows DX11 tech-demo. @YulFi: thanks, I just received the reply by email. Indeed Seven SP1 is required. I will update my Sandy Bridge system asap with the SP1 RC! 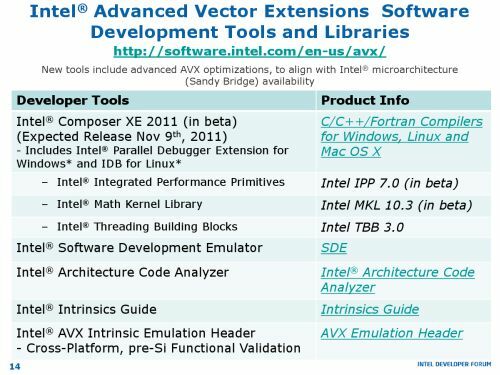 What is really amazing here, is that Intel chose as their first AVX showcase, a physics demo. I wonder if they are planning to delve into Nvidia physics territory. 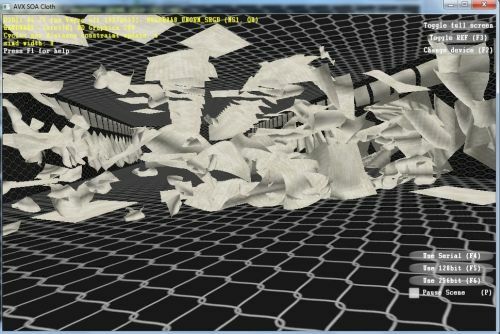 I can only hope, Nvidia works with them, to support AVX in future PhysX SDKs. Dunno if that’s possible programming wise, since I am not a programmer, but seems like it could be. 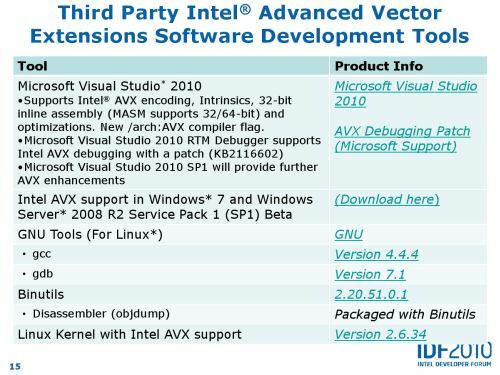 This would really help PhysX take off, since both Intel and AMD will feature AVX. I wonder how well or not this demo will run on the Bulldozer. It came to my attention that 4 core Bulldozer, will provide half the 256 AVX throughput compared to an Intel quad core, which does not seem very flattering. Especially in the light of the 256-128bit framerate JegX illustrated here. Once more, great job JegX. Oh on more thing. What other uses would AVX have? Could it speed up games? Aside from physics effects in games I mean. Can it provide faster vector generation, or to put it simply, feed the card(s) with geometry data faster? I take it could enhance path finding in RTS games, but if I am not mistaken, gpus can already do that. I remember froblins demo showcasing this. Also does AVX has anything to do, with rigid body physics? Yes. But Bulldozer will provide FMA4 while SB doesn’t even have FMA3 right now. Since FMA is 2flops worth it can bring in some cases Bulldozer near SB with AVX if I understand that correctly. In case you want to try out this cloth demo on a system without AVX, I recompiled the demo using AVX emulation. The SSE version should still run at full speed.